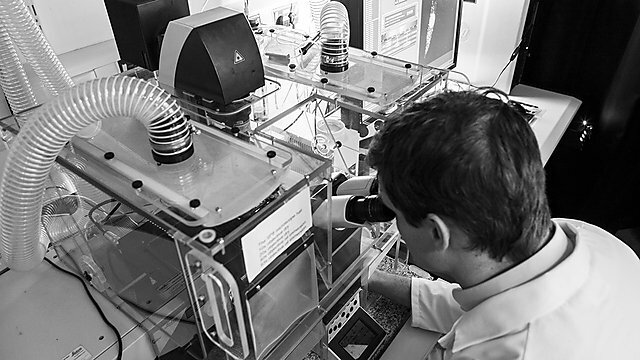 Dr Claudia Barros draws back the curtain of one of the cubicles to reveal a postgraduate and an undergraduate student examining a tissue sample through an advanced confocal microscope. On the screen next to them, magnified several hundred times, is a brilliant red image, as stunning as it is vivid. These are sentiments that you hear echoed across the University’s medical, biomedical and dentistry community when you ask about the Derriford Research Facility (DRF) and the difference it makes. With a footprint of 2,300 square metres, and a location adjacent to the John Bull Building and the neighbouring University Hospitals Plymouth NHS Trust, the DRF has transformed the landscape, both architecturally and for those research networks both within the faculty and with clinical colleagues at Derriford. “It’s a very significant development,” says Professor Oliver Hanemann, Director of the Institute of Translational and Stratified Medicine (ITSMed), which is headquartered in the building. “It’s a platform for research that can be used by scientists from our faculty, scientists from the hospital, and scientists from across the University. 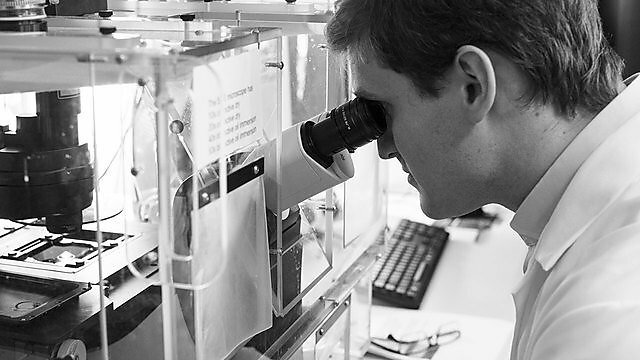 That philosophy of ‘bench to bedside and back again’ is key to the work of ITSMed, from brain tumours to vaccines; tissue regeneration to hepatitis; Parkinson’s to innovative therapies for cancer. And since the completion of the DRF at the start of the 2017/18 academic year, many of these research areas have been brought together for the first time. 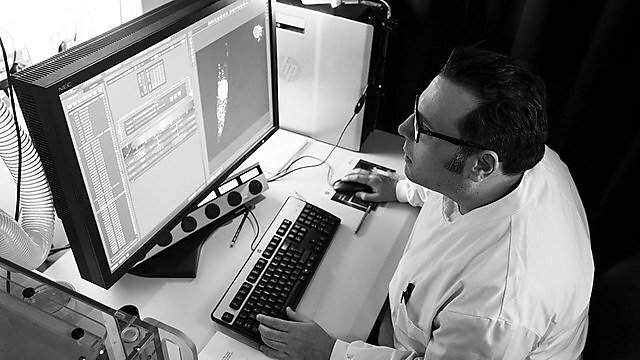 For Dr Barros, the ability to move quickly between laboratories and facilities such as the imaging suite is vital to both the in vivo and in vitro aspects of her team’s work. The development has also brought proteomics and genomics equipment under the same roof as her for the first time. Dr Barros is proof; after moving to her new office, she has struck up a research interest with her ‘office mate’ Dr Charles Affourtit, Associate Professor (Reader) in Mitochondrial Biology. In May, a curtain of a different kind was drawn by HRH The Princess Royal, as she unveiled the plaque at the DRF’s official opening. It may have come some eight months after the operational launch, but it was a fitting moment to reflect upon the progress of the wider medical school since its launch in 2013 (so too was the very successful scientific symposium that followed 24 hours later). 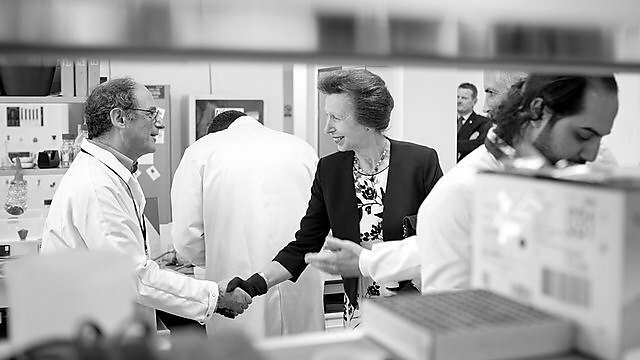 And the royal opening enabled HRH to meet a number of the academics who are very much part of its thriving future. Among them was Professor Mat Upton, whose work around antimicrobial resistance (AMR) is the focus of a new University commercial spinout company, working to develop and bring to market a new strain of antibiotic. “700,000 people die every year due to AMR and drug-resistant infections,” Professor Upton says. “If we don’t do something to address it, that figure could be 10 million by 2050. So the potential of what we’re doing is immense. The drug, Epidermicin, is two years away from testing on humans, and a further three from the marketplace. So, alongside the development work, Professor Upton is overseeing a continuous search for new sources of antibiotic in the environment around us, from the sea bed to the soles of our shoes. Whether it is Professor Simon Rule, and his work on mantle cell lymphoma; Professor Matthew Cramp, and his research into liver disease; Dr Shouqing Lou, and his analysis of Huntington’s disease; or the Brain Tumour Research team, whose Centre of Excellence is based there, the DRF is now home to some of the most life-changing research projects in the country.